Duren encloses a donation and renewal of her subscription to the Southern Highlander. She describes her interest in Berry graduate Allen Langston, who has just received a scholarship from her own school, Grinnell College. 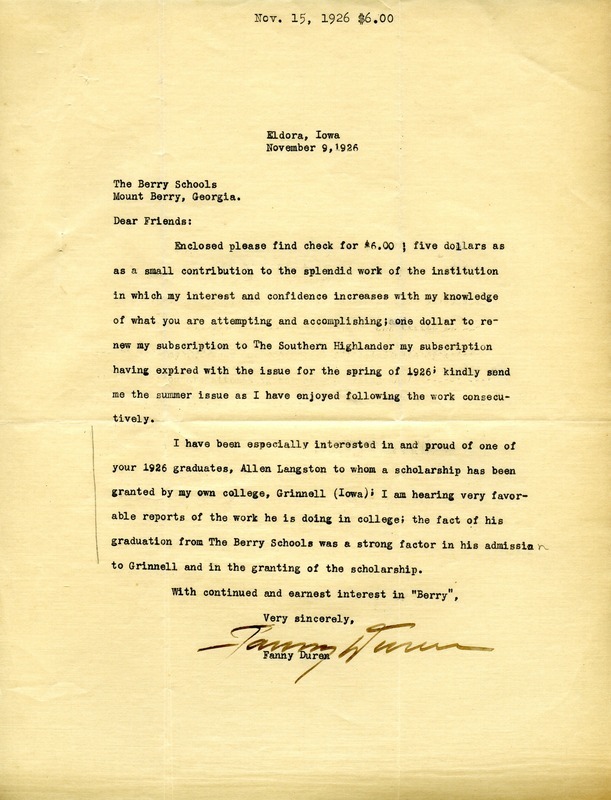 Fanny Duren, “Letter from Fanny Duren to the Berry Schools.” Martha Berry Digital Archive. Eds. Schlitz, Stephanie A., Sherre Harrington, et al. Mount Berry: Berry College, 2012. accessed April 24, 2019, https://mbda.berry.edu/items/show/2198.